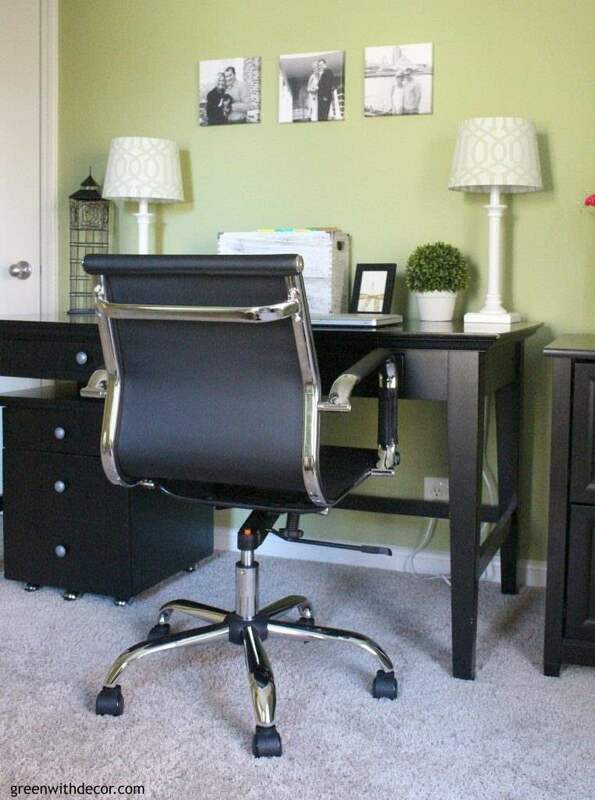 Disclosure: I partnered with some great sponsors on this office makeover! The paint for the bookshelf was provided by Country Chic Paint; the new hardware was provided by D. Lawless Hardware; the light fixture was provided by Lamps Plus. All opinions, images and love of room makeovers are 100% mine. Guess what day it is? Room reveal day!! Always one of my favorites. Something about taking a room from ugly to great makes me so happy. Our home office was pretty bad when we moved in, and we painted right away. Then we moved in some furniture and basically started using the room as a catch all for things that didn’t have a home. I’ve been on an organizing/decluttering spree around our whole house lately, so it was the perfect excuse to tackle the office. Alright, enough chatting. Here it is! To back up and give you the full picture, here’s what the room has looked like in various stages since we bought the house. I always love looking at these pictures to see how far we’ve come. This room was fun to finally get together! I love the new light fixture from Lamps Plus. Our old one was definitely in need of an upgrade. Painting the bookshelf was a project! It’s by far the biggest piece of furniture I’ve painted by hand, but sometimes painting is such a stress-reliever, I really didn’t mind it. 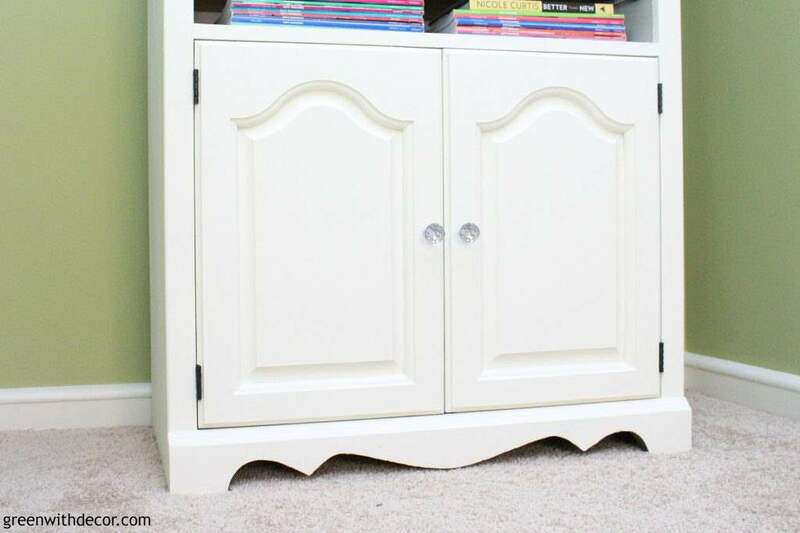 I used Country Chic Paint’s Vanilla Frosting, which is one of my favorite colors. You may remember it from my desk, my mom’s foyer table or this rustic sign in the bathroom. Total side note: I love to read. Even better when the books are pretty and can serve double duty as decor! I switched out the hardware, too with these crystal knobs from D. Lawless Hardware. I love the look of the crystal and white. It’s beachy with a little glam! I also switched out the knobs on the file cabinet with the crystal knobs. For such a small room, I’m amazed at all of the storage we fit in here. Between the closet, the bookshelf and the file cabinet, we don’t have to deal with a bunch of clutter sitting out, which makes me happy! I’ve had this desk since college, and I love it. But our old desk chair had to go. I love this new modern one from Lamps Plus! I picked out these curtains, and my mom (The Hand Model!) helped me hem them. The windows look sooooo much better with the curtains. I love our new curtain rods. We had some extra fabric left from the curtains, so we made this little pillow. Isn’t it cute!? I’d had this floor lamp from Kirkland’s for a few years, but as I was pulling the room together earlier this week (nothing like last minute! ), I decided it needed an upgrade. I bought this one. As part of my organizing spree, I organized the closet, turning it into a craft closet. I can’t believe we made it! Nothing like a deadline to kick a room makeover into gear! 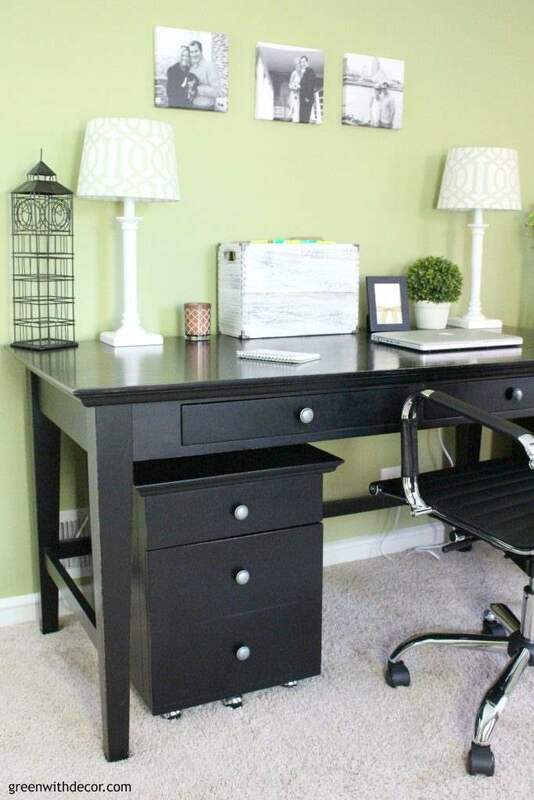 A big thank you to my One Room Challenge sponsors for partnering with me on this home office makeover! 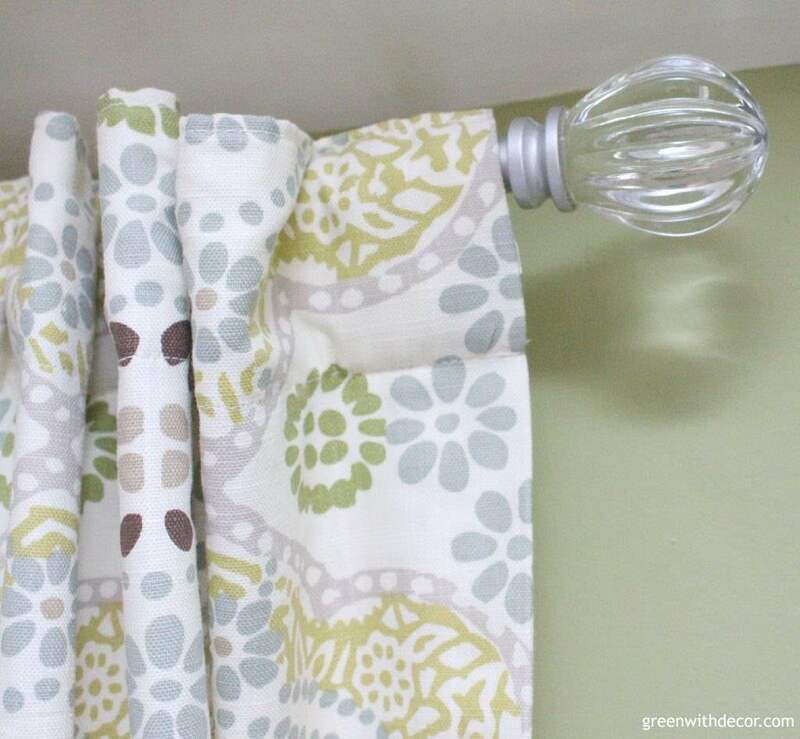 Curtain rod here, but it’s not always available. This one is similar. Woo-hooo! Looks great Meg, congrats! Thanks, April! We made it! SUCH a beautiful space Meg! LOVE the green! I love all of the changes and additions you’ve made, Meg! The new curtains are so pretty and the white is beachy and airy. Great choices! I’m also strangely intrigued by that “How to be a Grownup” book. I may be picking up a copy of that for myself! Thanks, Kim! I just love white paint lately, it brightens everything up. The book was funny – it’s by the same girls that wrote The Nanny Diaries! what a fantastic space, meg! 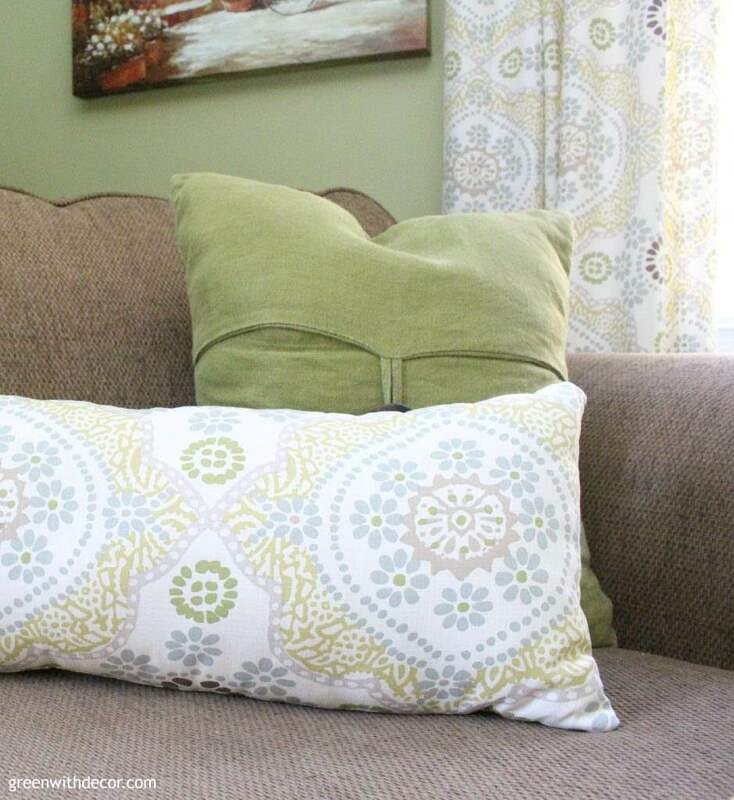 love the green, and the balance of soft and dark colors! Looks great Meg! Perfect space to get some work done now! Looks great, Meg! Definitely a place to get down to business in! Congrats on a successful One Room Challenge! Congrats Meg!! It’s perfectly YOU and looks like a cozy spot in your home for sure! Light and bright 🙂 Way to go!! Thanks, Heather!! I love how it came together! I love the new room! It looks so much more inviting and functional. Great job! You did such a great job, Meg! It looks like a great place to work! I love the green so much! And you chose such a pretty light fixture. Thanks, Emily! Glad you love the green! Fantastic job, Meg! I love how soft and pretty it all feels – and the perfect calm workspace to get stuff done in!! Your office looks fantastic Meg! I can’t believe you painted the bookcase by hand! How long did it take you? I also love the hardware you chose, and the draperies – so pretty! Thanks, Emily! Ha, it definitely took some time! But I still think it was easier than moving it downstairs to use a paint sprayer and then back up. I’d rather paint than move furniture! Sigh. A lovely organized work space. I need to get my office/craft room together asap! Thanks, Jessica! It was a lot of organizing but so worth it! Beautiful job Meg! I really LOVE those curtains and all of the little details! Thanks, Emily! Haha, I did go to bed very early last night – a little tired! Meg – this is gorgeous!!! What a beautiful transformation – and I love how you’ve added elements of ‘you’ in this room. There are bloggers who you know whose room it is once you see it and I can always tell which pics are yours. This is a stunner and you did an amazing job! Congrats! Thanks, Jen! That’s such a nice compliment, thank you! What a gorgeous space!! The green is so calming. I love the curtains and all the little details! I am in love with those curtains. So pretty. Doesn’t it feel so nice to have a “new” room? Thanks, Erin! It totally does! Absolutely lovely! I am looking for a new desk chair. Is your new one comfortable? How did you choose it-for looks and hoped it felt good? Or was it recommended to you? Thanks! Thanks, Lora! I had friends who had similar desk chairs and said they were comfortable. I loved the look of it so I went for it! Hope you find one you love! I love the interesting angles to the ceiling in this space! Looks so relaxing! Thanks, Colette! It’s one of the fun parts about living in an old house! I love your new office chair, Meg! Loved how much brighter this room looks. I can imagine how much time it took to repaint that bookshelf. Great job transforming this space! Yay to ORC being done! Thanks, Tee! It did take a while, but it was worth it! I love it all Meg! Enjoy this beautiful space! 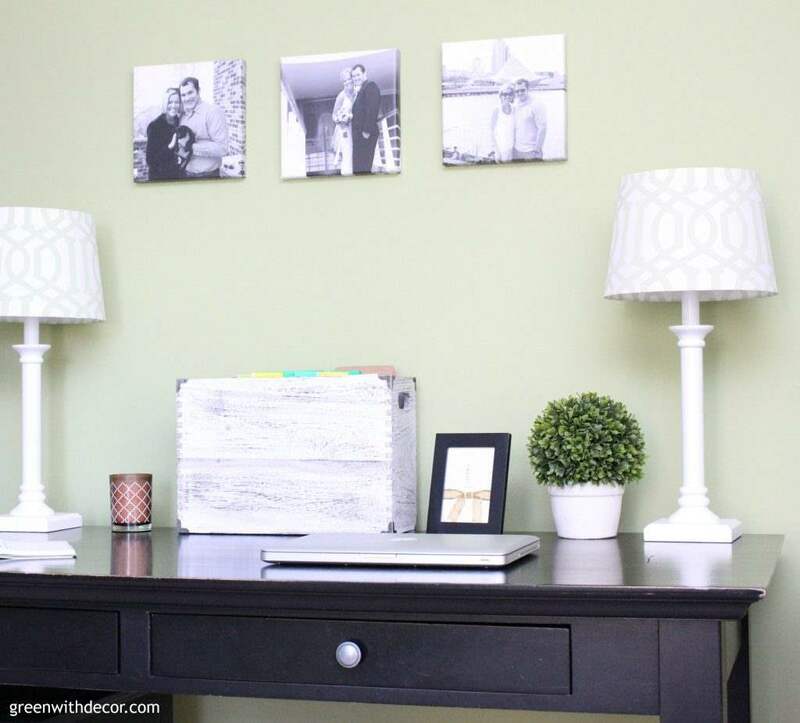 Meg – your home office looks fantastic! We love all of your personal touches – and your hard work paid off. Imagine all of the creativity being dreamed up in this space now! Meg, I would be thrilled to have an office like yours. My studio/craft room is such a disaster and there’s not even an area for a lounge chair. I love the color of green you’ve chosen, which is calming; and I love all the fine details to make this a space just for you. Thanks, Carol! Organizing it took some time, but it was so worth it! It looks soo good, and organized! I really love the pattern on your curtains. I bet you love working in there now! Thanks, Katy! I love the curtains, too! Meg, awesome makeover! 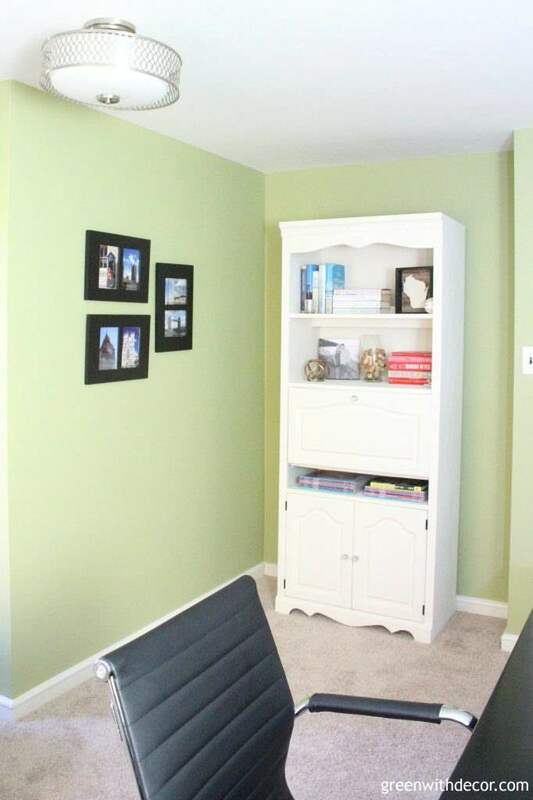 Love how the light green walls plays with the darker furnishings! I would be so happy to have a beautiful organized office space like this one! Meg, it looks great! What a great space to work in & love those curtains! Love your office. The dark furniture with the green walls really look nice. The curtains are such a pretty pattern. Great job. Such a pretty space! Great job! !